Kaz gets in way over his head in Star Wars Resistance. 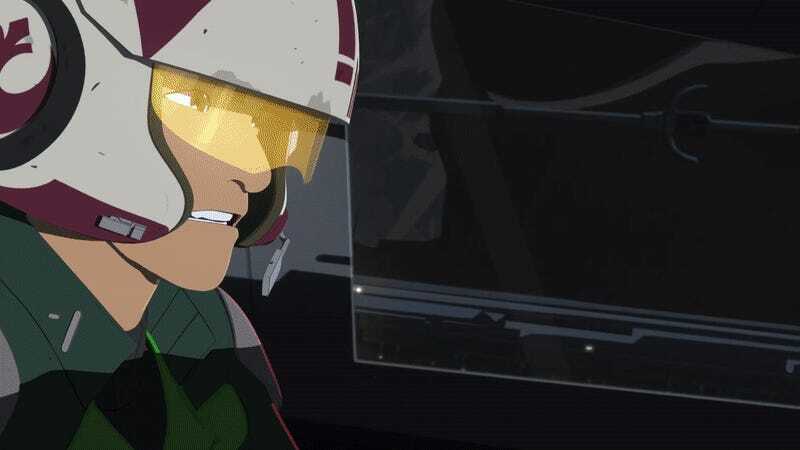 Our first look at Star Wars Resistance set up the basic premise of a Resistance spy operating out of an island that’s home base to a team of hotshot racers. But this new look at the Lucasfilm animated series gives us a much better idea of the bigger picture around Kazuda Xiono’s new mission—and the brewing war set to come between the Resistance and the First Order. Released today, the extended trailer gives us a bit more insight into the pilots Kaz (Christopher Sean) will now work alongside in his new mission to keep a check on whatever the First Order is up to in the shadows of Unknown Space. But it also gives us a lot more action as conflict between the Resistance and the First Order starts really ramping up. That means X-Wings—oh god, glorious X-Wings—but it also means more looks at both Oscar Isaac and Gwendoline Christie in action as Poe Dameron and Captain Phasma, respectively. If you were a little concerned that a show called Resistance might not have that much Resistance vs. First Order action in it while it focuses on a quirky group of pilots, then this should help allay some of those concerns. But it does have a bit more of Team Fireball too, who look like a total delight...and like they’re ready to get embroiled much more in Kaz’s mission beyond him doing some racing for them. We’ll have to wait and see just how involved they get when Star Wars Resistance flies onto the Disney Channel and Disney XD October 7.